So this is what Val Kilmer and his luscious locks were doing hanging with Kyle Gass and Jack Black, AKA Tenacious D. In the newly released video 'To Be the Best,' Black and Gass find their fates have gone in different directions following the failure of their film Tenacious D: In the Pick of Destiny and only Kilmer, Dave Grohl, and Josh Groban can help mental patient Gass and "Hollywood Jack" reunite (for their new album, in stores May 15). Also on hand? Tim Robbins. Why not? Who Should Play Haymitch in The Hunger Games? With Lionsgate milking its casting announcement roll-out as much as possible (today's news: All My Children's Leven Rambin and Meg Ryan/Dennis Quaid progeny Jack Quaid are your new District 1 tributes, Glimmer and Marvel!) it's time to play the speculation game with one of the series' most important supporting characters: Haymitch. Which veteran actors could fill the Hunger Games winner-turned-alcoholic mentor's shoes? It's a good week to be an animation fan, what with Rango garnering rave reviews and a new trailer for the Shrek spin-off Puss in Boots hitting the web. (Unless, like me, you caught the Puss in Boots teaser in theaters at midnight in front of the aptly-named Beastly. Not a smart life choice, in retrospect.) 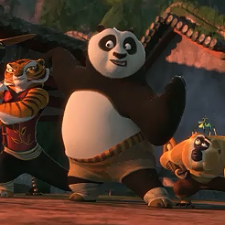 But what mystical, family-friendly, Eastern-influenced laughs await us in the new trailer for Kung Fu Panda 2?